As per the data available on the Department of Justice website, as on September 30, 2015, more than 95% of the mandated activities under the Phase I of the eCourts Integrated Mission Mode Project have been completed. Under Phase-I, National eCourts portal have became operational. The figures of pendency of District Judiciary Courts across the country, in aggregate for country and States as well as individual Court/Judges are left open for being accessed by anyone visiting the National eCourts portal ecourts.gov.in. You may read more about the National Judicial Data Grid (NJDG), here. Laptops have been provided to 14,309 judicial officers. Case Information System (CIS) software has been developed and made available for deployment at all computerized courts. This has made available online, data in respect of over 3 crore cases. Besides these, single window for filing petitions and applications, training of judicial officers and courts staff in CIS software and video conferencing facilities in Courts and jails has been provided for. An empowered committee has been constituted under the Chairpersonship of Secretary, Department of Justice, to give strategic direction & guidance to the project. The project is being implemented by National Informatics Centre (NIC). A project monitoring committee comprising of Department of Justice, representatives of eCommittee and NIC meets on a monthly basis to monitor the progress of the project. Steering Committee at each High Court oversees the implementation of the project in their respective High Court. 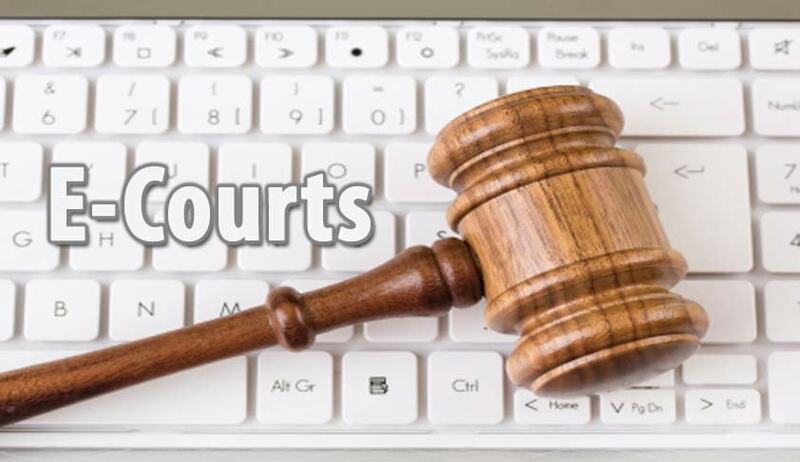 Further, e-filing of cases, e-payment of court fees, process service through email and through process servers having hand held devices, receipt of digitally signed copies of judgments are some of the services to be added in Phase II. The Policy Document also proposes installation of touch-screen kiosks and printer at all Court Complexes. These kiosks will provide services such as case status and daily order sheets to litigants without having to approach court officials. Court libraries will be computerized and service delivery will be effected through cloud computing. Phase-II of the project will further aim at attaining the full coverage of case data of courts across the country with gradual shift to auto pull mechanism for state court cloud installations which will ensure smooth updation of data on NJDG. The Policy Document also envisages preparation of mobile phone applications on various mobile platforms for latest case related information, and an SMS Gateway based infrastructure to facilitate push and pull based SMS for litigants and lawyers. Read the report on eCourt project here.